Oh, the sunflowers of my youth, their golden rays dancing in the wind. Helianthus was my bean plant of Jack in the Beanstalk. I would dream of climbing up the gigantic leaves into the heavens to find my pot of gold. During summer, you could find me in my secret hiding places by following the trail of sunflower hulls I would leave in my wake. You could measure the length of a mid-week church meeting by the height of discarded sunflower hulls piled beside me on the church pew. Saturdays, our special television night, was filled with Star Trek (the original, not reruns), sunflower seeds and popsicles. Now as an adult, I indulge myself in a childlike fascination of sunflowers with names such as 'Teddy Bear' or 'Music Box'. What tales I weave with a lemon yellow ‘Valentine' or a fluttering 'Monarch' sunflower swaying in a breeze. I sense breeders of sunflowers remember their childhood when they give their new hybrids a name. Sunflowers bring out the inner child in all of us. Standing next to an eleven-foot tall 'Russian Giant' certainly makes me feel as small as a child. Helianthus, a North, Central and South American native plant, was grown by indigenous people for over 3,000 years before the Spaniards discovered it and introduced the plant to Spain. For centuries, the sunflower was used in a variety of ways. Imagine the sun worshipping Aztecs' love for the genus. They glorified their temples with its sun-like golden rays, and priestesses adorned themselves with crowns made from the blossoms. The sunflower is a perfect choice for a sun-worshipping culture. In modern times, the sunflower is used extensively throughout our culture. The list is endless in its seeds' culinary value, from use in bread, ground into flour, or pressed into oils. Of course, we cannot forget my longtime favorite, roasted sunflower seeds. Plant uses include fodder for cattle and poultry, soap making, and candle making. In the garden, they attract beneficial insects, such as bees and butterflies, along with predators, such as lacewings and parasitic wasps. 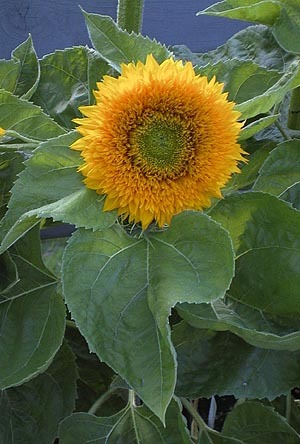 The sunflower is a lovely plant to beckon in the troops to stand guard and protect your garden from enemy pests. When the seeds ripen, the birds feast on the bounty. The entertainment value of watching a chickadee hanging upside down on the dried flower heads is worth growing the plant in itself. Helianthus is an herb used medicinally as a diuretic and expectorant. The stems are used for the making of paper. The list of uses for this plant seems endless. As for me, I love them in my garden. Although I grow fewer annuals now, the annual sunflower usually finds a place. The tall ones make a quick temporary screen and the multi-branched ones are outstanding as cut flowers. To grow, they need a rich, well-drained soil in a full-sun position. I wait for the soil to warm up and usually plant mid-May to mid-June depending on the weather. 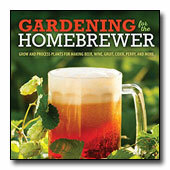 If I plant too soon and they do not germinate, I do a second sowing later on in the month. One of my favorite places to plant them is around the compost pile. They enjoy the position with the compost to feed them and soon hide the pile from view. 'Autumn Beauty' grows with six-inch-wide flowers, with mahogany red colors (some almost chocolate colored) and stands about five feet tall. 'Mammoth' is an old standby with its ten-inch-or-larger golden flowers, growing six to seven feet tall. Next to a compost pile they grow taller. 'Music Box' is multi-branched in many colors, from dark red to creamy yellow and also produce bicolor flowers five inches wide, with the plant reaching 2½ feet tall. 'Russian Giant' reminds me of the sunflowers of my youth, reaching eleven feet tall with golden flowers ten inches across. 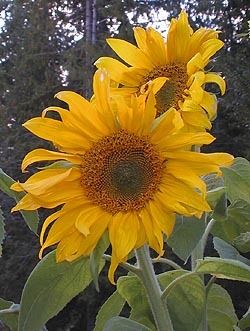 'Teddy Bear', with its double yellow flowers five inches across grows, about three feet tall. 'Italian White' is one of my favorites for cut flowers. Multi-branched with numerous pale lemon yellow flowers four inches wide, the plant reaches five feet tall. I must go now so I can make my garden ready for the giant and petite sunflowers. They will grace my summer garden, bringing a drop of sunshine even on a rainy summer day. Look for me this summer, reaching for the heavens in search of the gold. 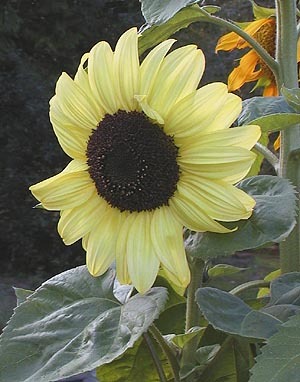 In the year 2002, I began trialing many different cultivars of sunflowers. 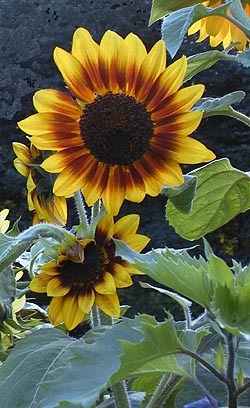 Each year I add new sunflowers to the Plant Gallery and Growing Guide at the end of the growing season.